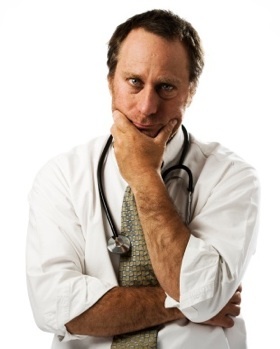 Giving bad news to a patient is perhaps one of the most difficult things physicians have to do. You want the person to know the truth but your goal is to try to use as much compassion as you can to cushion the blow. And of course their reaction to the news can affect you emotionally as well. The severity of the reaction to bad news is sometimes more related to the patient's perception of things. If you tell a professional ice skater that she's going to lose her leg to an infection, she may react to this with more emotion than if you tell her she has cancer. If your patient is 70 or older, the reaction to bad news may or may not be as bad as you might think. I remember once being called to the Emergency Room to admit a patient with abdominal pain. When the CT scan came back showing a large pancreatic mass with probable liver metastases, I was devastated to have to tell him this. As I explained the findings and told him that he very likely had inoperable cancer, he looked at me recognizing my concern in having to tell him this; he smiled and said, "It's okay. Don't worry about me. I've had a good life." Here he was, just finding out that he had a terminal illness, consoling me! Some people just look at things a little differently than you might expect. I remember an elderly 90+ year-old arthritic, blind, nearly deaf, but delightful lady who asked me in July one year if I thought she would make it till Christmas. I happily told her that I thought it was very likely that she would make it till Christmas and well beyond that, to which she forlornly replied, "Oh no! I was hoping I'd be gone by then!" These are somewhat unusual examples of how people respond to bad news or even good news as in the last case just to show the spectrum of patient's perceptions about death and dying. Most people are not happy to get bad news about their mortality - occasionally because they fear death itself, but more often because they won't be able to go on doing the things that they have enjoyed doing up until now, or because they will be separated from loved ones, or because they fear the pain and suffering they might encounter prior to death. It's an unwanted and frightening change in their lives of huge proportions. So how do you tell someone they have a terminal illness (which, of course is not the only kind of bad news you will have to deliver but one of the worst and perhaps the most difficult to talk about)? Sometimes it helps to approach this gradually if you can. Suppose you see someone in the office with a cough - a 60 year-old chronic smoker. You get a chest x-ray which shows a 2 cm irregular mass in the right hilum. You look at the x-ray and you tell him that he has an enlargement or density on the x-ray that will need further investigation. He may ask, could it be cancer? You say well it could be cancer but there are a lot of other things it could be as well and you list a few things like infection, benign nodule, sarcoidosis, etc. He may ask what's the likelihood of it being cancer and being truthful you say well it's a definite possibility, perhaps even probable. Don't lie, but you don't have to be terribly negative or morbid at this point. You then schedule some tests, like a CT scan and then tell him the mass looks suspicious for a tumor of some kind. If he asks, could it be a cancer, you say yes, but before we can say for sure, we have to get a biopsy. Lots of people have nodules that turn out not to be cancer. The pulmonary consultant recommends a bronchoscopy and does the biopsy which ultimately shows cancer. Based on the CT results, it appears to be inoperable. This is really bad news. You should not tell him this over the phone unless you have no other choice in the matter. Never, ever leave a message like this on an answering machine. And never tell him this on a Friday night when nothing will be done about it till the next week. You should talk to him in person about it and with his wife or with one or two family members present. Sit down with him and explain with concern and compassion that the biopsy did show cancer, and that it appears to be inoperable, but let him know that there are treatments available and that we need to get an oncologist involved to help decide the next best course of action, and then proceed with this plan as soon as possible by calling the oncologist yourself to make the connection, assuming that is the direction the patient wants to go. There are many patients who won't remember much that you say after you've mentioned the word "cancer", so don't expect them to remember a lot about that visit other than the fact that they have cancer. You should be sure that they understand what you're telling them, however. If you use the word "malignancy", they may not understand what that means. Some authorities say that we should ask them to repeat what you've said so you're sure they know what you've told them. I wouldn't use this in every situation since it may seem somewhat cruel, like rubbing salt into a wound, but if you're careful to show compassion while asking, it should be okay to do this. Also the presence of a family member will be helpful later when the patient is trying to remember what the doctor said. A follow up visit should be scheduled soon after to discuss more details, be sure the patient understands the situation, answer questions and make plans for further testing or initiation of treatment if that has not already been done. In the above example, with each step in the process, the patient has time to digest and think about what's going on so that he won't be quite so shocked at the end when he finds out what the actual diagnosis is. Also, with each step, he is being told the truth, although perhaps somewhat vaguely at first, but nevertheless, the truth. The third factor in this process is that you have never left him without hope, even when confronted with the diagnosis of inoperable lung cancer. I would not discuss prognosis with him at this point unless he requests. He may not want to know everything right away. If he does request, then I would again be truthful that statistically, the long term prognosis may not be good, but there are many people who do not follow the statistical curve and that it's very difficult to predict how a particular individual will do. Again, there's some room for hope. You follow him along and now several years later, he is running out of treatment options, the cancer is widespread. The patient and his wife come in to see you and he asks, how much longer do I have? Again you should give him your best guess but emphasize that it's only a guess. If you have a hospice program in your area, you may ask him to consider this as a good support service and explain the advantages of that option. He will probably be concerned about whether his symptoms of pain, etc can be controlled, and you should be able to reassure him that you will do whatever you can to provide comfort. You should discuss, if you haven't already, whether he has a living will and whether he wants resuscitation and life support if his heart stops or if he stops breathing. If he is unclear about this, you can give him your recommendation that it will be unlikely to help and will only prolong the situation. You should do all of this as compassionately and as truthfully as you can. Don't rush through it. Answer all his questions carefully and answer all the family's questions as well. Don't forget to involve the family in this process unless the patient requests that you don't. They are suffering perhaps as much as the patient is although in a different way. They need you to let them know what to expect and how to help him and also that it's best to go ahead and talk to him and each other about their emotions, rather than trying to hide them and pretend this isn't happening. Hospice personnel can be very helpful in providing this kind of support. Never, ever leave the patient or the family with the idea that there is nothing else you can do. Here is the hope factor again. The patient should feel comfortable that you will be right here for him and that he can call on you if he needs help. Always schedule another appointment for him, especially if you are the primary care provider, so that he knows you're not giving up on him. So, in summary, there are three basic things to remember when giving bad news to a patient: Be honest, be compassionate, and always leave room for hope. This will make it a little easier for the patient and the family to cope with the situation, and they will be very grateful to you for your care and concern. This page was last updated on August 16, 2015. From "Giving Bad News" to "Communication"
From "Giving Bad News" to "HomePage"